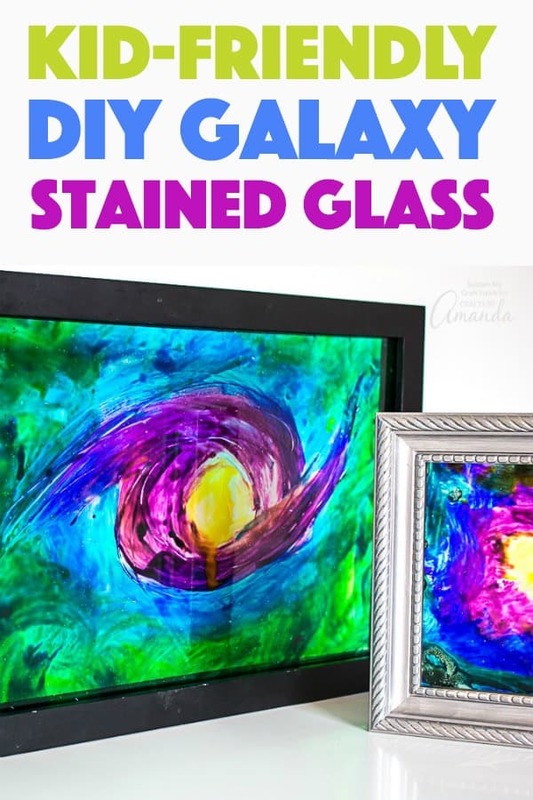 Faux DIY Stained Glass: the perfect galaxy project for kids! 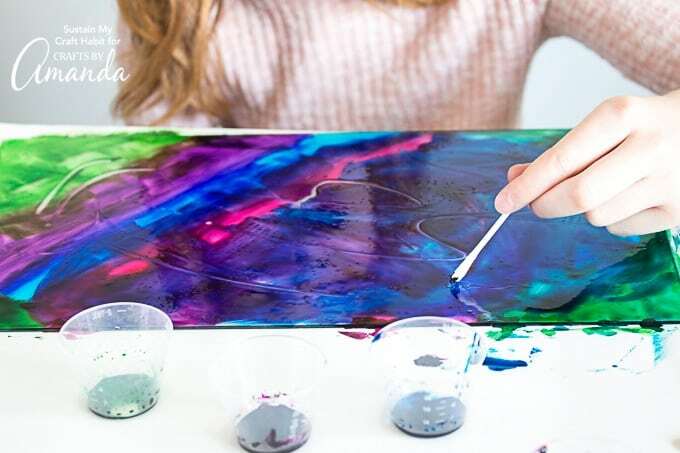 If you’re looking for a fun project that both you and the kids will enjoy, then this DIY stained glass idea is out of this world! 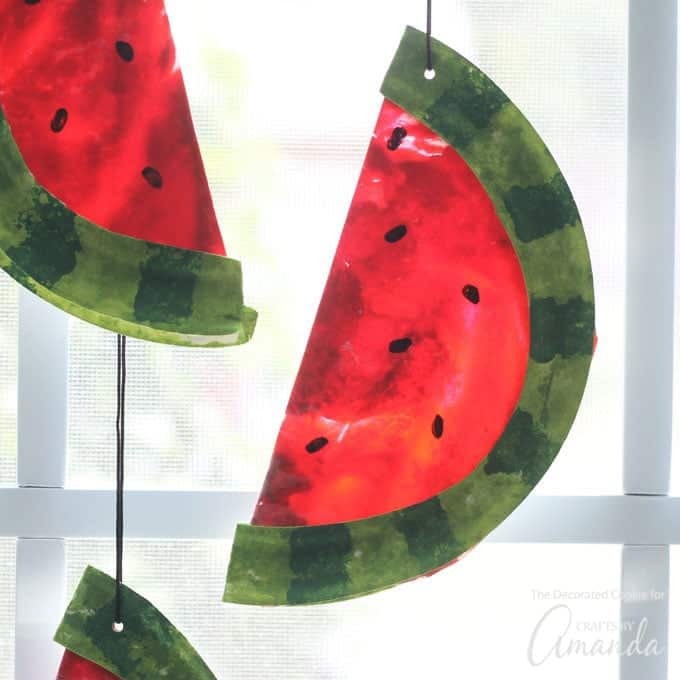 This craft would be fun to do at home or even as a camp craft or classroom project! 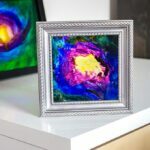 I gathered up the materials I had around the house and in no time at all, my daughter and I were creating our own stained glass pictures together. I wanted my piece to resemble outer space so the glitter glue was key to mimicking twinkling stars in the galaxy. There’s really no right or wrong way to do this craft, the result can be quite abstract or very realistic. 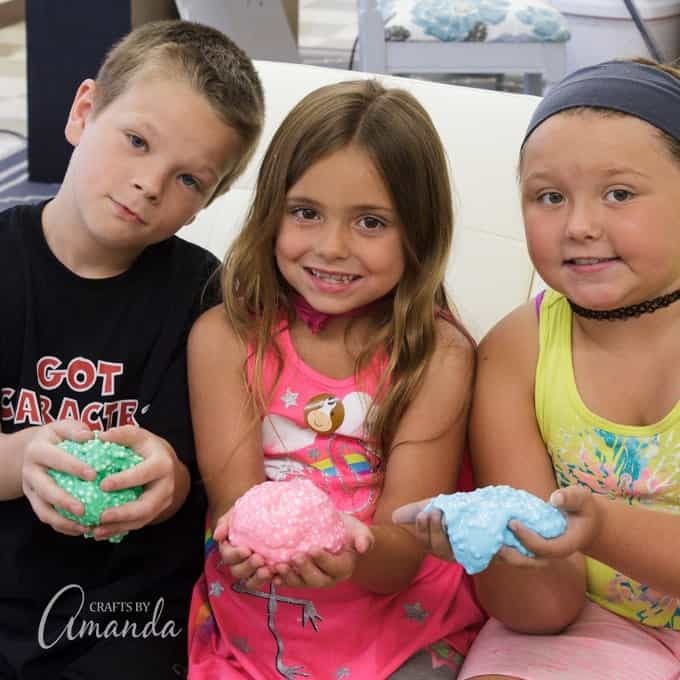 Typically at Sustain My Craft Habit, my sister Jane and I stick to rock painting projects with the kids like these shark painted rocks, so this stained glass idea was a fun alternative. For more out of this world ways to keep your kids busy, check out this galaxy constellation card making idea and this paper plate flying saucer craft. Protect the work surface with a sheet of newspaper or some plain paper. You can wear gloves to avoid staining your fingers with food coloring but I found the dye washes away fairly easily. Add clear glue to the center of the glass. Add a couple of drops of food color to glue (we added yellow dye). Mix the two together on the glass using your paintbrush. 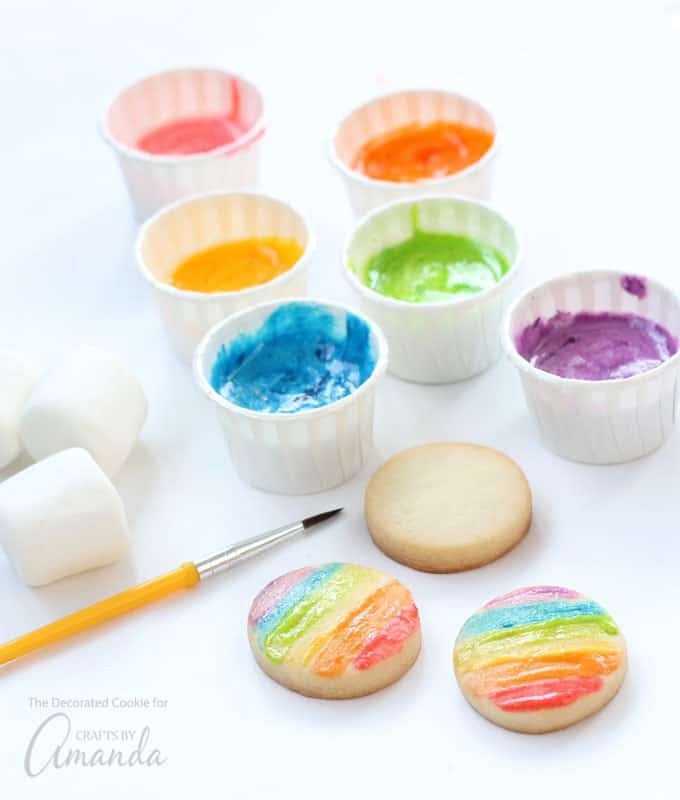 Add glitter glue to the surrounding area and add a few drops of food color throughout (we added purple). It works best if you paint one color at a time to avoid the colors mixing together and turning brown. 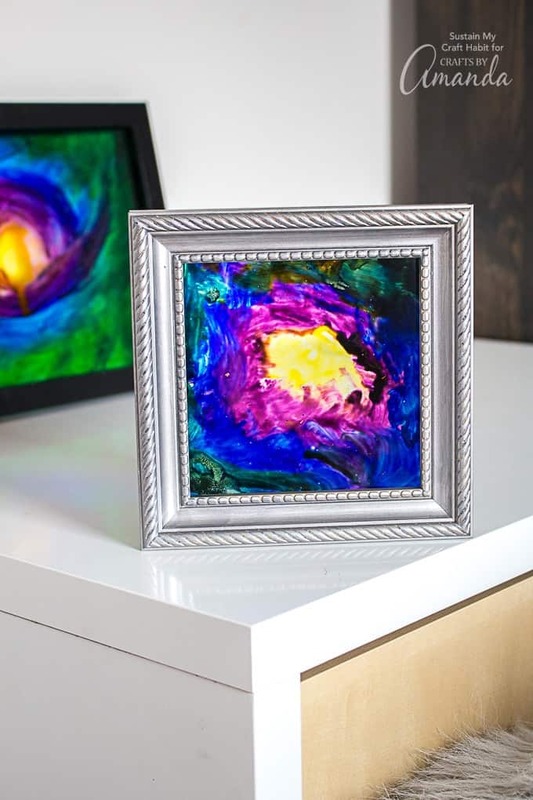 Paint a few swirls to resemble outer space. Continue working outwards adding new colors and mixing the existing color on the glass. The more dye you add, the darker the result. It’s best to work fairly quickly so that the glue doesn’t harden before you had a chance to blend the joining colors. If you’re not happy with the painting, you can easily wash it away with some warm water even after it’s dried fully. When you’re satisfied with the masterpiece, leave it to dry fully before placing in the frame. Insert into a frame and enjoy! My daughter was amazed at how much it looked like an actual stained glass window. 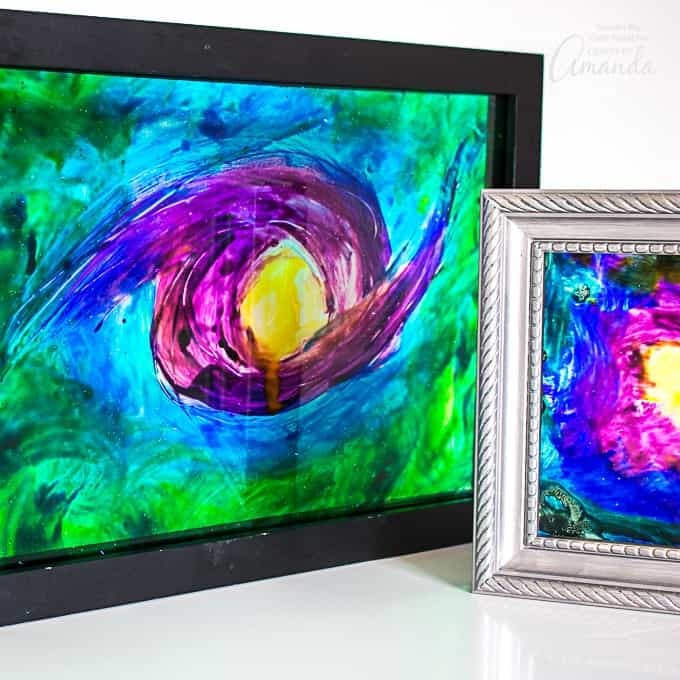 Although her piece didn’t turn out so space-like, the color combinations are still very beautiful and it looks amazing in her magenta painted bedroom. 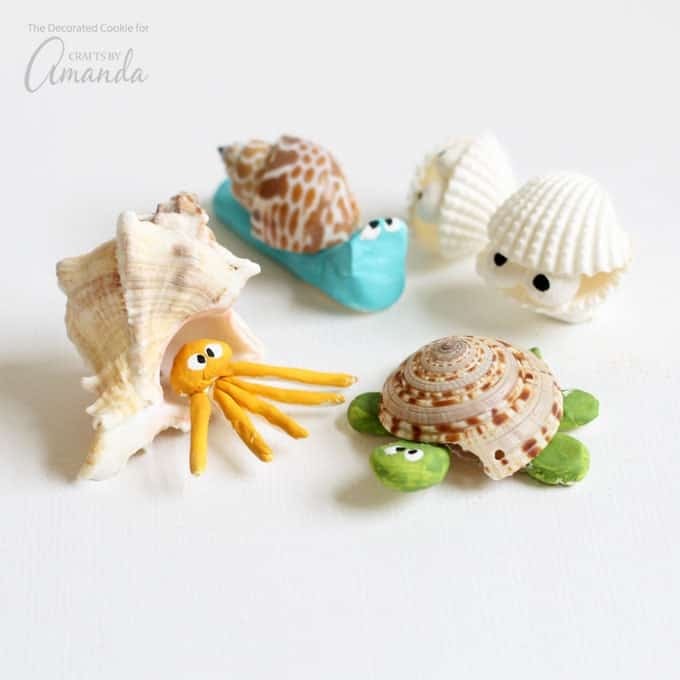 Find more fun crafts to do with the kids below or check out our roundup of Colorful Kids Crafts! Watch the video below to see the process in action! 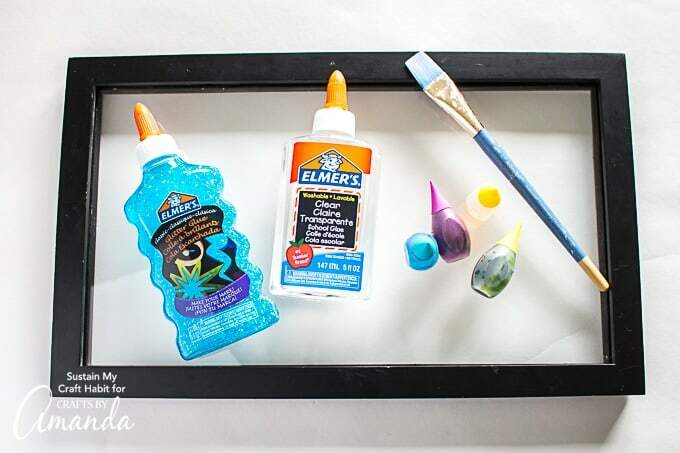 A fun craft for kids, this DIY Stained Glass project is out of this world!